A red sweater always makes an impact and this fabulous knit by Elena Miro is made from a blend of natural fibres with the added luxury of a touch of silk. Lightweight and comfortable it's a musthave for any capsule wardrobe. 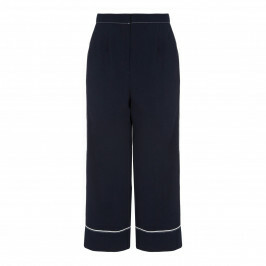 Team with navy culottes for a chic smart casual look. Red fine knit roun neck sweater long sleeve. 50%viscose, 40% cotton, 10% silk. Wash at or below 30°C or dry clean. Do not tumble dry. SIZE HELP: L = UK size 18, XL = UK size 20/22, 2XL = UK size 24. Model’s height is 180cm (5ft 11in). For more information, please call customer services on +44 (0) 20 8455 0005, or one of our stores.